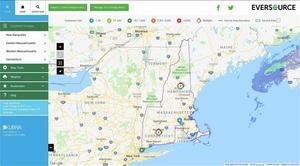 As part of its ongoing efforts to better meet the needs of customers, Eversource now has a new, state-of-the-art outage map that provides comprehensive information allowing customers to zero-in on details related to an outage at their home or business. With one click on the new outage map, customers can view up-to-the-minute outage information, including the number of customers affected, the time and cause of the outage, and an estimated time of restoration. Customers can also now report an outage using new features on the enhanced map. Eversource launched its first phase of an ongoing effort to improve customer outage communications in December 2016, with the enhanced customer notification system. That feature provides customers with outage information and updates in the method they chose– text message, email, or phone. Customers have since shared positive feedback with the energy company related to the availability of more timely information. The newly enhanced outage map is the latest upgrade providing customers with the greater level of detail they requested.